This is Led mini chandelier battery powered Dollhouse Ceiling Light, designing and decorating your dollhouse has never been easier with this Crystal Chandelier, Gold and our selection of other Dollhouse Miniatures. 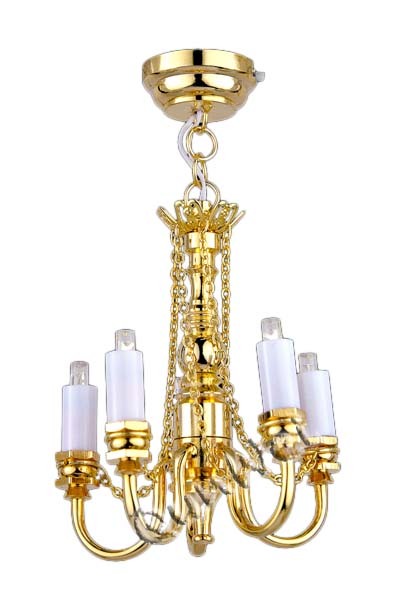 Complete your Dollhouse Furniture collection with this Crystal Chandelier Gold for your miniature dollhouse Ceiling light & Dollhouse Wall Light . Our affordable, high quality Lighting and Crystal Chandelier Gold are the essentials for any mini enthusiasm. Looking for ideal Dollhouse Miniature Chandelier Manufacturer & supplier ? We have a wide selection at great prices to help you get creative. All the Dollhouse Miniature Crystal Chandeliers are quality guaranteed. We are China Origin Factory of Battery Operated Mini Chandelier. If you have any question, please feel free to contact us.